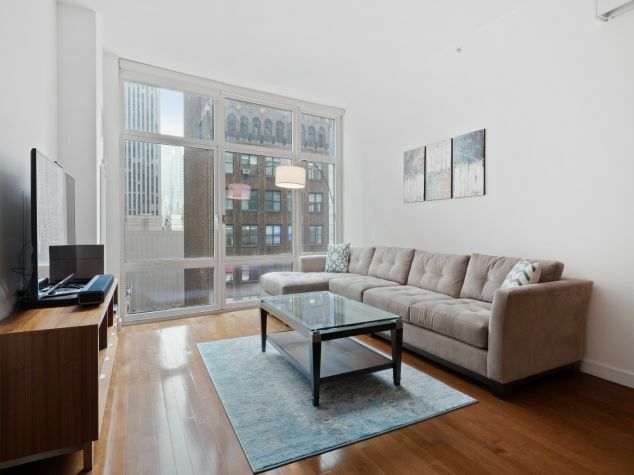 Apartment 61L in the upper reaches of Trump Tower has just been listed. The 2,510 sq. 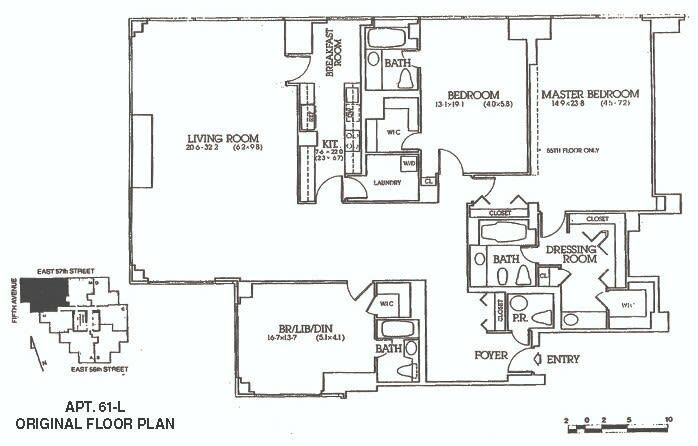 ft. "L" apartment, the finest three bedroom, three and one-half bath apartment of the building only existed from the 55th Floor to the 63rd Floor, and many of those have now been combined with other apartments so to have an "L" come available at this high level is a true rarity. 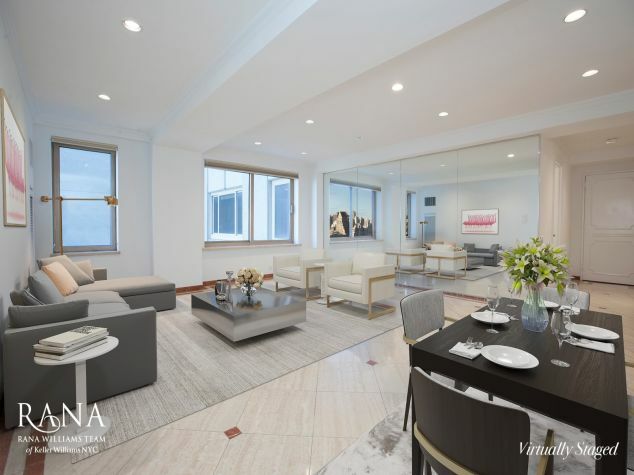 Situated on the 61st floor this apartment affords spectacular panoramic views of Central Park to the north, sweeping west to the Hudson River and then south to feature views of Manhattan's most iconic buildings, including the Empire State Building, The Chrysler Building and The Freedom Tower. With the backdrop of stunning views in every room, this magnificently renovated apartment is at once light, open and airy but quietly underscored by the elegance and richness of the highest quality marble, stone and wood finishes interpreted by the finest craftsmen. Floating high above Central Park and the City, the setting is without compare. As you enter the understated foyer you are drawn forward into the subtly detailed grand corner living and entertaining space comprised of a large gallery, the living and dining room with three breathtaking exposures complimented by a wet bar with glass and enclosed cabinetry, and an open chef's kitchen with top-of-the line appliances which provides for warm, comfortable entertaining in the most elegant of settings. The kitchen includes a large pantry area with custom storage and a washer/dryer. A sumptuous powder room is discreetly positioned off of the gallery. Immediately adjacent to the living room and open off of the gallery through double doors is a corner den/office/bedroom with spectacular City views to the south and west. 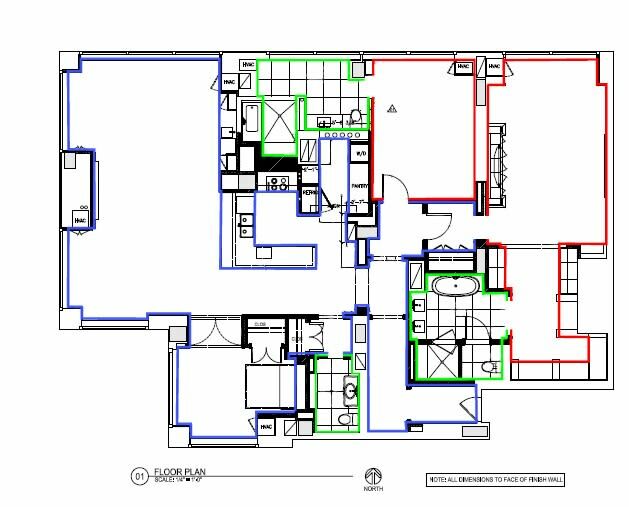 This room can be appointed to further enhance and compliment the living/entertaining area of the apartment or can be privatized to create a third bedroom. From the gallery, moving north into the bedroom wing, there is a beautifully rendered bedroom with amazing views of Central Park, generous closet space and its own luxurious bath with a shower overlooking Central Park! cabinetry of the highest quality which leads into the very private bathroom with a large soaking tub, stall shower, double sink and private water closet, all appointed in keeping with this most magnificent setting.